I’m not a terribly big fan of honey by itself. I feel like I’m definitely in the minority on this one. But to me it’s so bitter that it ruins any enjoyment of the flavour of the honey itself. But when it complements something a little sweet it becomes something I can fall in love with. If I was making this as a dessert by itself I would have gone to more trouble to pair it with some other flavours. It would go lovely with either fresh berries or maybe poached stone fruit. Sweet syrups, fruity jellies or caramels could adorn the top to make it look a little special. 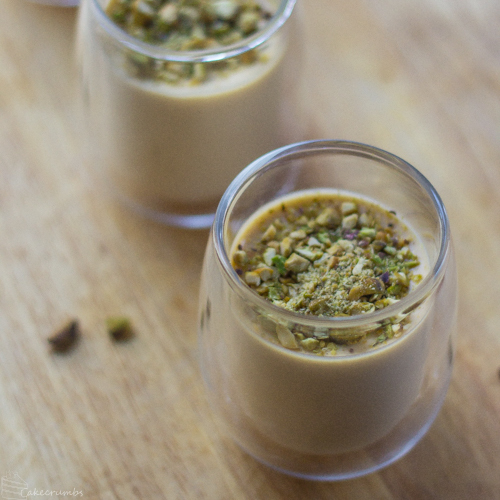 Or you could take the lazy route like me and throw a bunch of chopped pistachios on top! I’ll be revisiting this recipe next week when I show you guys the entremet I made, but meantime here’s how to make the panna cotta itself. Note: This dessert can be served in a glass or ramekin, or unmoulded just prior to serving. Prepare 4 glasses or moulds. Bloom the gelatin by sprinkling it over the water in a small bowl and leaving aside for 5 minutes. Pour mixture into the glasses or moulds and allow to set in the fridge for 4 hours or overnight. I get a little giddy everytime I see a new post from you 🙂 So happy that you’re back. Definitely trying this one, I usually think panna cotta is a bit boring on its own but a bit of honey might just be the thing to spark my interest! You’re so very sweet ♥ There’s sooo much you can do with panna cotta flavours. It’s becoming a regular entremet layer for me so I’ll be sure to post some favourites in future!